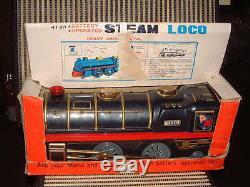 THIS IS THE EVER-SO-RARE MODEL NUMBER 4130, WHICH IS THEIR "STEAM LOCO" TRAIN. 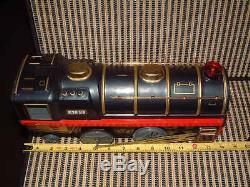 THIS TRAIN IS USED AND IS NOT NOS (NEW OLD STOCK). ALTHOUGH, YOU HAVE NO DENTS, CREASES, CORROSION OR SIGNS OF USAGE ON THE BODY, THIS TRAIN WAS USED VERY LIGHTLY FOR THE FIRST FEW YEARS OF IT'S LIFE..... AND THEN SIMPLY FORGOTTEN ABOUT! HAVING HUNDREDS OF MODEL CARS TO CHOOSE FROM, MOSTLY PORSCHE AND CORVETTES, I HAVE DECIDED TO START LISTING SOME OF THESE HERE ON E-BAY. 9 5 % OF THESE ARE ONE-OF-A-KINDS LISTINGS AND I WILL DO MY BEST TO SHOW YOU AN ARRAY OF PICTURES AND DESCRIBE THEM TO THE BEST OF MY ABILITY. THIS BANDAI TRAIN IS NO EXCEPTION TO THIS RULE! THE EXACT DATE THIS TRAIN WAS MADE ELUDES ME, BUT IF I WERE TO GUESS, I WOULD SAY THIS IS FROM THE LATE 1960'S TO THE VERY EARLY 1970'S. THE DATE WAS 1981 AS I RECALL.... 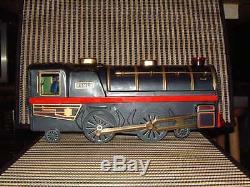 THE ENTIRE TRAIN IS MADE OUT OF TIN/METAL OR AS THEY SO PROUDLY SAY ON THEIR BOX "HEAVY GAUGE METAL". THIS TRAIN IS LOADED WITH COOL FEATURES.... ALL OF WHICH STILL WORK PERFECTLY!! BELOW I HAVE LISTED THESE FEATURES. REALISTIC PISTON SOUNDS (VARIABLE SPEEDS IN FORWARD TOO). RUNS FORWARDS AND STOPS, 6. CONDUCTOR MOVES BACK AND FORTH AND 9. WAIVES A FLAG OUT OF THE WINDOW. THE TIN LITHOGRAPH IS BEAUTIFUL AND BRIGHT ON THE INTERIOR (INSTRUMENTATION) AND EXTERIOR. THE BODY IS IN EXCELLENT TO SHOWCASE SHAPE/CONDITION! YOU WILL FIND SOME VERY SHA LLOW SCRATCHES LOCATED THROUGHOUT THIS MODEL, BUT, YOU DO HAVE TO SEARCH FOR THESE. YOU WILL FIND NO DENTS OR DINGS ANYWHERE ON THE BODY. THE RED LIGHT FUNNEL IS ORIGINAL AND FUNCTIONS AS IT SHOULD. ALL OF THE GRAPHICS ON THIS TRAIN ARE NOT STICKERS, BUT, PLACED ON VIA TIN LITHOGRAPHY THE CONDUCTOR IS MADE OF PLASTIC AND HIS FLAG IS MADE OF TIN. HIS LEFT ARM PIVOTS UP AND DOWN (MANUALLY). HE DOES AUTOMATICALLY MOVE BACK AND FORTH AT DIFFERENT PHASES OF THE TRAINS CYCLE. THE WHEELS ARE ALL MADE FROM TIN AND THE LARGER REAR SET DOES HAVE A RUBBER INNER SECTION AS THESE ACTUALLY DO WORK TO PROPEL THIS TRAIN. THE REAR LITTLE WHEELS ARE FREE FLOATING AND. DO TOUCH THE GROUND AND ROTATE FOR THAT COMPLETE SENSE OF MOVEMENT. THE LARGER FRONT WHEELS DO SPIN FREELY AND ARE ALSO FREE FLOATING AS WELL. THE LARGER REAR WHEELS ARE CONNECTED TO THE PISTON DRIVE AND ARE OFF CENTER TO ONCE AGAIN, GIVE THIS TRAIN THE SENSE OF PISTON/STEAM DRIVEN ACTION WHEN MOVING! 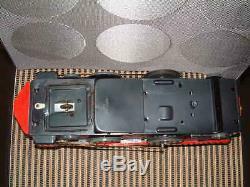 ON THE BOTTOM OR CHASSIS YOU HAVE THE BANDAI LOGO STAMPED INTO A METAL COVER/LID. 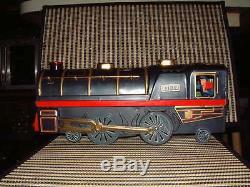 HERE YOU DO HAVE A COUPLE OF CONCERNS..... AT ONE POINT IN TIME, BATTERIES WERE LEFT IN THIS TRAIN WHILE IN STORAGE. FORTUNATELY, THEY LEAKED DOWN AND THE BATTERY COMPARTMENTS DOOR TOOK THE BRUNT OF THIS NEGLECT (THIS HAS BEEN REPLACED WITH ANOTHER BATTERY COMPARTMENT DOOR FROM THE SAME MODEL). 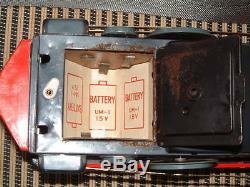 THE SIDES OF THE BATTERY COMPARTMENT ARE IN VERY GOOD TO EXCELLENT CONDITION/SHAPE, THESE SURVIVED VERY WELL. THE CONTACTS ARE ALL ORIGINAL AND STILL FIRMLY ATTACHED. THE BATTERY COMPARTMENT DOOR IS STILL FIRM AND IN FACT, THE WHEEL ATTACHED TO THIS BATTERY COMPARTMENT STEERS THE TRAIN AND STILL DOES SO WITH NO ISSUES! SO YOUR CONCERNS ARE THE SLIGHT CORROSION ON THE BATTERY COMPARTMENTS DOOR AND THE VERY LITTLE CORROSION ON THE INSIDE OF THE BATTERY COMPARTMENT ITSELF (AROUND THE EDGES). THIS HAS BEEN LIKE THIS EVER SINCE I OWNED THIS MODEL. ONCE AGAIN, THE AREA OF CONCERN IS ALL SUPERFICIAL IN NATURE. THE BATTERIES FIT WELL AND NO ISSUES EXIST (OTHER THEN ASCETICS). THE LITTLE LOCK HOLDS THE BATTERY COMPARTMENTS DOOR PERFECTLY CLOSED AND THE WHEEL ON THE BATTERY COMPARTMENTS DOOR SPINS AND STILL LOCKS INTO MULTIPLE POSITIONS. THE BOX OFFERED HERE IS IN GOOD SHAPE/CONDITION. IT STILL HAS THE ORIGINAL THREE (3) STAPLES HOLDING IT TOGETHER. TH IS IS A DUAL PURPOSE BOX AS IT DOES OPEN TO BECOME A DISPLAY OF SORTS. THIS STILL WORKS AS IT IS DESIGNED TO DO. YOU DO HAVE SOME SMALL TEARS LOCATED ON THE RED SECTION ON THE BOTTOM CORNERS. ON THE INSIDE OF THE BOX, THE TRAINS REAR AXEL HAS DONE SOME INTERNAL DAMAGE TO THE BOX. AND AT ONE POINT IN TIME, A PIECE OF TAPE WAS USED TO HOLD THE BOX TOGETHER (OR CLOSED), WHEN THIS WAS PULLED OFF (WAY BEFORE MY TIME), IT PULLED SOME OF THE GRAPHICS OFF. SOMEONE ADDED SOME TAPE TO KEEP THIS SOMEWHAT TOGETHER. THEN YOU'LL HEAR THE WHISTLE COME ON AND THEN OFF, NEXT YOU'LL HEAR THE BRAKING SOUND AS THE FUNNEL LIGHT STARTS TO FLASH AND THE CONDUCTOR BEGINS TO WAIVE HIS FLAG. THE TRAIN COMES TO A HALT.... THE FUNNEL LIGHT BECOMES SOLID DURING THIS PHASE. YOU'LL THEN HEAR A "SNAP" OF SORTS AS THE TRAIN DOES SOME INTERNAL ADJUSTMENTS. THE FUNNEL LIGHT STARTS TO FLASH ONCE MORE AND THE CONDUCTOR BEGINS TO WAIVE THIS FLAG. THE WHISTLE BELLOWS OUT AGAIN AND THE TRAIN NOW GOES INTO THE OTHER DIRECTION. THE CONDUCTOR STOPS MOVING AND THE FUNNEL LIGHT GOES OUT ONCE AGAIN.... I TAKE PRIDE IN MY MODELS THAT I OFFER HERE IN THE E-BAY WORLD. I DO HAVE OPTIONS AND I CHOOSE TO OFFER ONLY THE VERY FINEST THAT I HAVE AVAILABLE. I TEST EVERYTHING PRIOR TO LISTING THEM AND ONCE AGAIN PRIOR TO SENDING THEM OFF. I DO THIS SO WE WILL BOTH BE VERY HAPPY WITH THE END RESULT, IT'S THE ONLY WAY I DO THINGS! 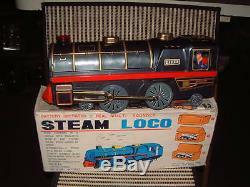 ALL-IN-ALL YOU WILL BE VERY, VERY HARD PRESSED TO LOCATE ANOTHER BANDAI MODEL 4130 STEAM LOCO THAT LOOKS LIKE AND WORKS LIKE THIS ONE DOES!! ADD TO THIS THE FACT THAT YOU HAVE THE ORIGINAL BOX AND THE TRAIN IS FULLY FUNCTIONING... NOW YOU HAVE SOMETHING THAT ANY COLLECTOR WOULD BE PLEASED TO ADD TO THEIR COLLECTION OF TRAINS, TIN, BATTERY OPERATED, VINTAGE, JAPANESE MODEL COLLECTION!! ONCE AGAIN, PLEASE TAKE A GOOD LOOK AT THESE PICTURES AND IF YOU HAVE ANY QUESTIONS OR DESIRE ADDITIONAL PICTURES, PLEASE FEEL FREE TO CONTACT ME VIA E-BAY MESSAGING AND I WILL DO THE REST! 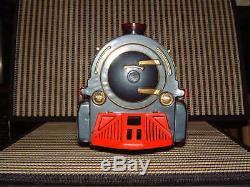 THIS VINTAGE TIN/METAL BATTERY OPERATED BANDAI STEAM TRAIN IS AN EXCELLENT EXAMPLE OF A MODEL AND OF AN ERA THAT HAS LONG PASSED US BY. 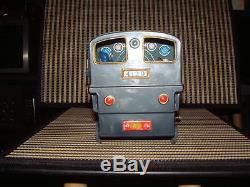 THIS IS A RELATIVELY NEW STORE FOR ME HERE ON E-BAY, BUT, I COME WITH A WELL OILED AND POLISHED TRACK RECORD! A GOLD T/RATED POWERSELLER WITH OVER 6 YEARS OF THIS STATUS BACKING ME. I SPECIALIZE IN PRIMARILY THE AUTOMOTIVE FIELD AND I CONCENTRATE WITH/ON PORSCHE, BENTLEY, AUDI AND. I HAVE A UPS ACCOUNT AND MOST OF MY OFFERINGS HERE SHALL BE SENT THAT WAY. SO PLEASE BE PREPARED FOR THIS ON YOUR END! 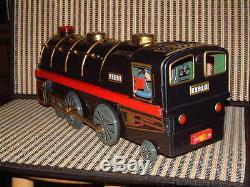 IF YOU HAVE ANY PROBLEM PAYING WHAT IT COSTS TO RECEIVE THIS BEAUTIFUL, RARE AND FULLY FUNCTIONING BANDAI STEAM LOCO TRAIN FROM ME IN A TIMELY AND SAFE MA NNER, ONC E AGAIN, I STRONGLY SUGGEST AND ASK THAT YOU PASS ON THIS. INTERNATIONAL BUYERS, PLEASE READ THE VERY BOTTOM OF THIS SECTION AS IT DOES APPLY TO YOU..... AS MENTIONED ABOVE, THIS IS A NEW AREA FOR ME (HERE ON E-BAY) AND I DO TRY MY BEST TO DO AS GOOD AS I CAN. THIS HAS BECOME A FULL TIME BUSINESS FOR ME AND I REALLY ENJOY DOING IT. I WILL CONTINUE TO DO SO TILL IT BECOMES A BURDEN AND I CAN NO LONGER ENJOY IT. I WILL BE ADDING TO THIS STORE WEEKLY (OR TRYING TO) AND HOPEFULLY YOU WILL SEE THAT I DO EXACTLY WHAT I SAY AND DO SO IN A VERY TIMELY FASHION. 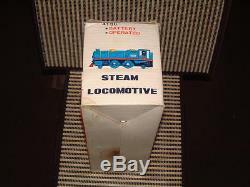 THIS IS THE ONLY MODEL OF ITS KIND CURRENTLY LISTED HERE ON E-BAY WORLDWIDE THAT IS A FULLY FUNCTIONING MODEL WITH ITS ORIGINAL BOX! I GUESS ONE COULD SA FELY CALL THIS RARE WITHOUT THE FEAR OF THIS COMING BACK AT YOU! IT IS MY INTENTION TO LIST AT LEAST ONE NEW MODEL/TOY CAR A DAY UNTIL SUCH A TIME WHEN I CONSIDER MYSELF BURNT OUT. I HAVE LITERALLY HUNDREDS OF DIFFERENT MODELS TO CHOOSE FROM. SO IT MIGHT BEHOOVE YOU TO CHECK IN WITH ME REGULARLY. WHO KNOWS WHEN YOU MIGHT FIND THAT ONE MODEL/TOY THAT WILL COMPLETE YOUR COLLECTION! THIS IS WHERE I THANK YOU FOR YOUR TIME IN READING ALL OF THE ABOVE. IN ORDER TO VIEW MY LISTINGS IN A CONCISE AND ORDERLY FASHION, ALL YOU NEED DO IS TO LOCATE THAT SMALL. DOOR A TOP THIS PAGE. THIS IS LOCATED JUST BELOW MY SELLERS ID AND FEEDBACK TALLY. THE VIRTUAL DOOR TO MY STORE HERE ON E-BAY! IN ORDER TO STREAMLINE YOUR SEARCH FURTHER, ONCE YOUR IN MY STORE, TO THE LEFT YOU WILL SEE A "SEARCH" BAR, IF YOU'D LIKE TO SEE JUST MY MODEL CARS, JUST TYPE IN "MODEL CAR" AND JUST MY LISTED MODEL CARS WILL POP-UP. IF YOU'D LIKE TO SEE SOME LP'S... I THINK YOU GET THE JIST OF THIS NOW! 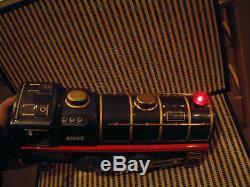 The item "BANDAI BATTERY OPERATED, TRAIN, TIN STEAM LOCO NO. RARE" is in sale since Wednesday, March 09, 2016. This item is in the category "Toys & Hobbies\Vintage & Antique Toys\Tin\Other Vintage Tin Toys".911" and is located in North Kingstown, Rhode Island. This item can be shipped worldwide.